Sundays 9-10 a.m., January 10- February 28, 2016, in the West Wing. Last year our church endorsed Commit2Respond and launched a number of different efforts toward climate justice and communication. Some of us are ready to gather in all humility and seek a meaningful path that we can share with our children and grandchildren. We know about the fires, floods, and famines, the injustice, the sixth extinction. Now what? Guided by an extraordinary collection of essays and poems, we will meet to consider not what shall we do, rather, what kind of person do I want to be? The editors of Moral Ground: Ethical Action for a Planet in Peril bring passion, clarity, and power to this most troubling question. If you would like to participate, sign up at the Adult Education table or email Climate@uusarasota.org. We will limit the class to 25 people for the sake of continuity and depth of group connections. 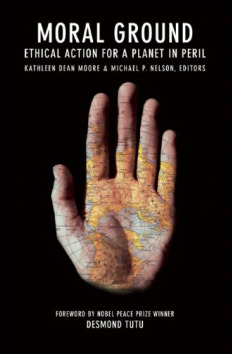 We suggest but do not require that you pick up a copy of the book, edited by Kathleen Dean Moore and Michael P. Nelson. Each week one of the leaders will present a brief summary of a piece from the book, and then we will explore in one or more small groups how we might apply the reading to our own quests. Virtue! Something we rarely discuss. It’s time.